The Galaxy S10 series will represent a major step in the evolution of Samsung’s flagship smartphones. But with over a month still to go until its debut, the excitement over the whole thing appears to have got to certain employees. 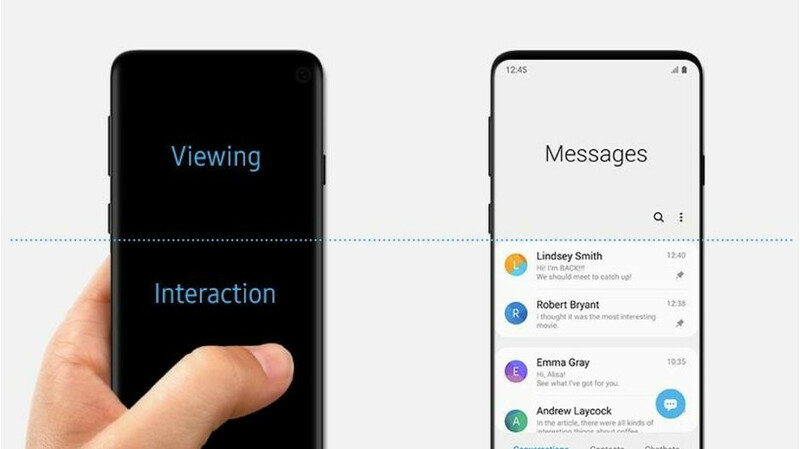 In a recent Samsung Newsroom article (via GSMArena) dedicated to the benefits of One UI, the South Korean giant accidentally included one particular image which appears to showcase the regular Galaxy S10 which, as expected, features minimal bezels, a curved edge display and, more importantly, a display hole in the top-right corner. To add further fuel to the fire, Samsung has since removed the image and replaced it with a modified version. This one removes the front-facing camera completely and replaces the previously-thin bezels with significantly thicker ones in the hope of resembling a current-gen design. Presumably, the image in question was a marketing one that would have been used following the Galaxy S10’s announcement on February 20, or perhaps during the Unpacked event itself. Unfortunately, accidents happen and in this case, they have been published prematurely. So the camera hole is only going to be visible when the screen is off? All of that wasted UI space. Visually, in these two photos, there is a lot of wasted space. It's not aesthetically pleasing. Its functionally pleasing. I'll take that over a brief second of seeing half a screen. Still android so still no. Stupid to pay $1000 for Android. You can get the same in a Chinese phone for $200. Stupidity doubles when consider Samsung phones don’t get updates after a couple of years. For something different try an iPhone! There’s nothing like an iPhone. your right. that's why I don't use the iPhone. Something different? iPhones have been basically the same grid of icons since 2007. How exciting. Compared to Android's exciting grid of icons? Interesting, the Line between the S and the Note will be even thiner with this kind of UI.